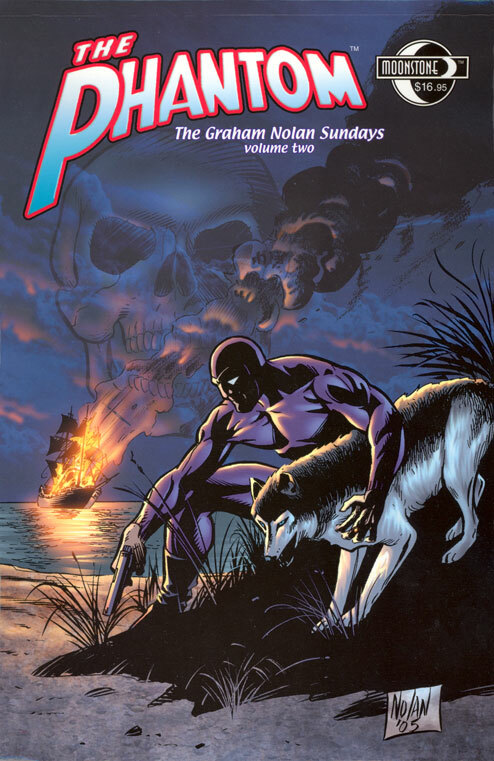 A Publishing History in the U.S.A.
After an absence of almost seven years, The Phantom returned to American comic stores in 2002. Moonstone Books are a small independent comic book publisher from the south suburbs of Chicago who obtained the rights to publish The Phantom in August 2000, after commencing negotiations with Hearst in November 1999. Formerly a small publisher of black and white, creator-owned comics since 1995, Moonstone decided to plunge headlong into full-colour graphic novels and comics. 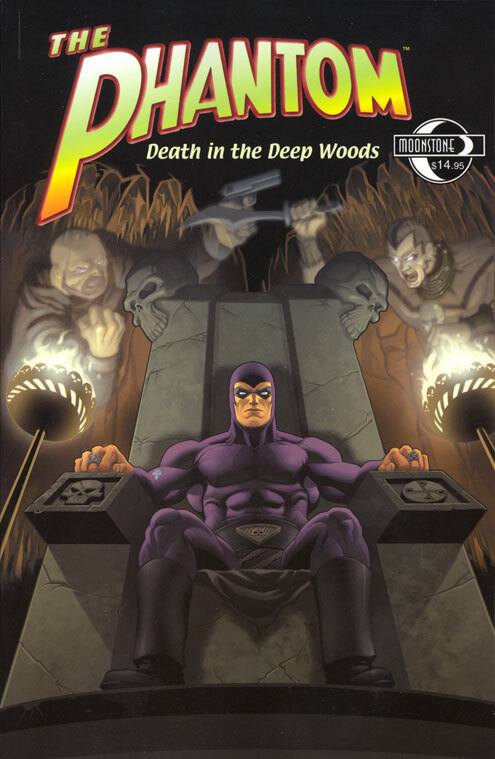 Their first issue of The Phantom appeared in February 2002. It will come as no surpise to Phans that The Phantom is Moonstone's most successful title! From the beginning in 1999, I was Moonstone's "Phantom consultant" and my name appeared in the front of each issue. This role came to an end in January 2006 by mutual agreement, due to ongoing disagreements about editorial and scriptwriting decisions. During my association with Moonstone, I was urged to "play with the team" and not publicly criticise their efforts. Now that I'm independent once again, you can expect to read my honest opinion about these comics, rather than only the positive spin. So for the many stories from Moonstone in which the Phantom shot or knifed villains, or otherwise did things that completely departed from established lore, rest assured that I did my best to change the script but was ignored on the basis of "that's what sells". Commencing in February 2002, Moonstone produced a series of stand-alone graphic novels. Each book ran for 52 pages with high quality glossy paper and vibrant colours. The beautiful painted art covers by Joel Naprstek were reminiscent of George Wilson's classic covers for Gold Key and Avon. The last book in this format was published in June 2004. In May 2006, Moonstone returned to the graphic novel format with Legacy , running for 100 pages and the price doubled to US$12.95. This book was intended to look like the actual chronicle of the First Phantom, with the "olde English" manuscript printed in a florid hand-written font on pages with a parchment effect, weathered by the occasional ink spot and cup stain for added authenticity. Each double-page featured a lightly-coloured pen and ink illustration in the style of old-fashioned engravings. But there lay the major fault of the book: it attempted to be a simple chronicle but was presented in a style aimed to visually entertain the reader which therefore diluted it's authenticity. Would the First Phantom have been so narcissistic to illustrate his own chronicle and utilise page-turning cliffhangers? Surely not. Added to that, the story departed substantially from Lee Falk's established Phantom lore in numerous respects. The end result was a disappointing effort that fell short of the hype that preceeded it. Note: The title of Volume 3 was misprinted as Treasures of Bagalla and has been digitally corrected in the above cover scan. If only it were so easy to correct the printed copies! The first three stories from Moonstone's graphic novel series were collected in a trade paperback in May 2003: The Singh Web , The Treasures of Bangalla , and The Ghost Killer (published in the order that they were actually written). This book was squarebound, ran for 164 colour pages and had a cover price of $16.95. The paper was matt in appearance rather than glossy as in the original graphic novels. The excellent painted cover art was by Doug Klauba. The book featured an introduction by Ed Rhoades (Editor of Friends of the Phantom), commentary by Ben Raab and Ron Goulart, and a bonus sketchbook of Phantom submissions by various artists. Apparently the tradepaperback sold out completely! A second edition with an alternate cover was released in early 2006. 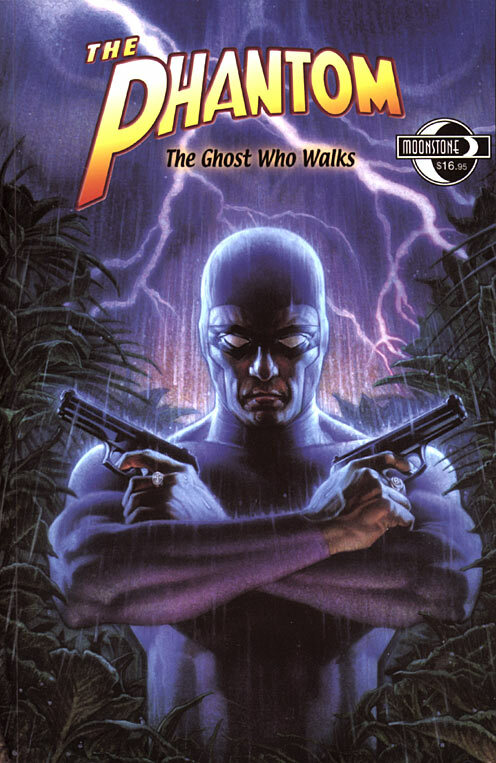 Moonstone decided to swap from the graphic novel format to a comic book format for The Phantom , starting in December 2003. Each comic contained 36 pages, with stories running for two consecutive issues. The print quality was excellent once again although the colouring was usually too dark. The series is ongoing and many more stories are currently in the works. Starting with issue #12, Ed Rhoades from Friends of the Phantom has started contributing a regular column. 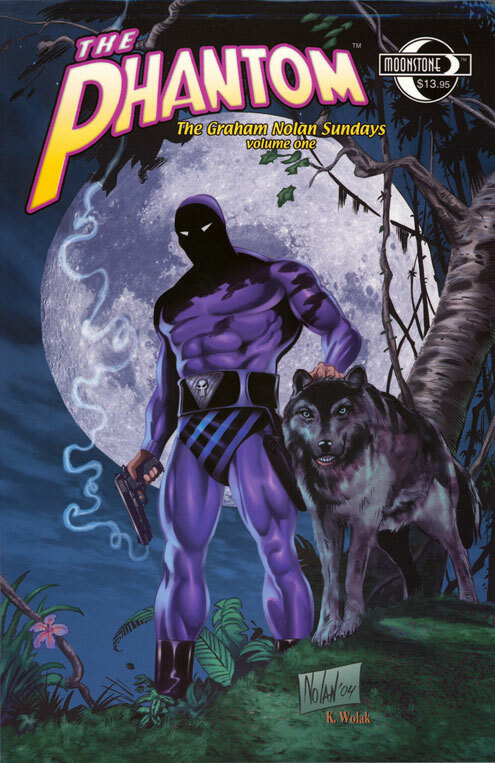 In January 2007, Moonstone released a "Phantom Annual". The book runs for 68 glossy colour pages, and is broken into five chapters, each with a different writer/artist/colorist team. But that's where the differences end since each story covers the same theme of The Phantomc confronting a Singh pirate and his cronies (each in a different generation and location), then beating the daylights out of them and recovering a piece of a jade dragon statue. The premise of the story is typically stupid since The Phantom need only protect one piece of the statue to prevent it's "magic powers" coming to life, and yet he goes ahead and collects the lot. Of course, The Phantom is lured into handing them all over to the Singh in the final chapter. About the only thing going for this book is the heavily detailed art from Rubin Procopio on Chapter 2, which unfortunately suffers from poor perspective in some scenes. The rest of it fits perfectly into the Moonstone pantheon of bloodfest. Avoid! 11 Jul 2006 $3.50 Nanamaru Doug Klauba Ben Raab Rich Burchett Andy B. * Note: Comic #12 was also published with an alternate limited edition cover by Ruben Procopio and Brad Vancata. Moonstone dabbled for the first time with reprinting a collection of newspaper strip stories in 2005. Volume 1 was published in February and collected four Phantom Sunday stories with art by Graham Nolan: The War Mongers , The Briefcase , Terror in Mawitaan , and The Sinbad Stone (2001-2004). The book was squarebound, ran for 108 colour pages and had a cover price of $13.95. The superb cover was drawn by Graham Nolan and coloured by Ken Wolak. The paper was matt in appearance with vibrant colours of excellent print quality. The cover was portrait format with binding at the top edge, but the pages inside were in landscape format to suit the Sunday page layout. The Sunday strips were completely intact including "drop-out" panels. The book was introduced by Graham Nolan himself. Unfortunately some pages were printed out of order affecting the first and last stories, forcing the book to be discounted to $9.95. With close attention to the dates that appear on the strips, it is quite easy to read the stories in the correct order. Volume 2 was published in December 2005 and collected five Phantom Sunday stories with art by Graham Nolan: Woduro's Secret , The Lion's Head Tamarine , The Snake Goddess's Island , The Viking Fortress , and The Ghost Train (2000-2005). The book was squarebound, ran for 148 colour pages and had a cover price of $16.95. The cover art was drawn by Graham Nolan and coloured by Peter Pantazis. The print format was the same as Volume 1, and this time around Moonstone made absolutely sure all the pages were printed in the right order! In combination, Volumes 1 and 2 represent the complete sequence of Phantom Sundays from August 2000 through to March 2005, and are a must have for those interested in the "post-Falk" era of the Phantom newspaper strips. Moonstone planned to publish a special collector's edition of all these stories combined into one premium hardcover book. The quoted price for this book was a thoroughly ridiculous US$69.95! Not surprisingly, the retailer support was too small, so the plan was cancelled. The first two stories (four books) from Moonstone's comic series were collected in a trade paperback in December 2005: Stones of Blood and Curse of The Phantom . This book was squarebound, ran for 124 colour pages and had a cover price of $14.95. The cover art was by Pat Quinn and Dave McCaig. If you're trying to decide between the trade paperback and the original comics, I recommend avoiding this book and simply buy the regular comics with these stories - you'll save yourself a dollar and get the original covers too.